…a whole lot of arid! So the night bus from Mendoza to La Serena…by the time they switched the bus lights on at 6.30am in the morning I felt like someone had hit me in the face! It was not a comfortable journey to say the least, but we got across the border into Chile simply enough. The Argentinean customs and Chilean customs literally sit next to each other at the border office and after you’ve filled in a couple of forms, you que up one side to get stamped out of Argentina and then que up right next door to get stamped into Chile. Bags get scanned and then your through. We got into La Serena 2 hours early but the hostel was open so we dumped our bags and chilled until our room was ready. We stayed at Hostal el Punto which had a more B & B feel to it than a hostel and lots of German retired couples staying in it which was quite random. But it was pleasant enough with lovely sunny courtyard areas and a good breakfast. That afternoon we ventured out to explore the city. Downtown is quite pretty with colonial style buildings and its right by the sea. However the beach was quite unpleasant with lots of rubbish in the sand and unfinished beach side developments along the front. There was a cool lighthouse there though so we took a look around that and headed back into town. Really La Serena is just a base to explore the Elqui Valley inland towards the Andes, which we did on day 2 of our time there. We went with the straight forward named tour company- Elqui Valley Tours (! )- and our tour guide for the day called Hector was really good fun and knew everything. A real brain for facts and figures and he would pop quiz us through out the day to make sure we were listening and taking the info in! So lets see how much I remember…. So Elqui Valley. 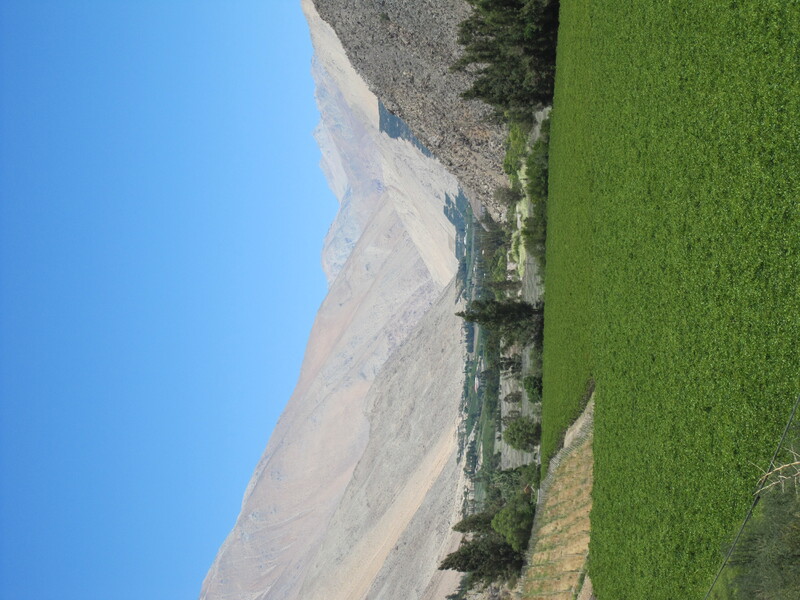 The word ‘Elqui’ means ‘Sound of the Andes’ and its a grape growing region harvesting grapes for eating, and making into wine and the national drink called Pisco. What you notice as you drive there is that this valley is really thin and the farms spread outwards from the small rivers that flow through the valley. The farmers also farm upwards terracing the valley sides to grow more vines or avocados which apparently have deeper stronger roots. And then above the green fields of produce the mountains are just arid, nothing on them apart from a few cactus’. Hopefully the picture above shows a bit of what I’m talking about there. Hector drove us through the valley and made stops at the Puclaro Dam and the capital city of the valley called Vicuna and told us about the history along the way. Everywhere you go you see references to a lady called Gabriela Mistral who was born and raised in the area and won a Nobel Prize for Literature . There are streets, plaza’s, shops, schools etc all named after her. She is evidently well-loved but she did give all her royalties from her poems to the children of the Elqui Valley so you can kind of see why they love her! 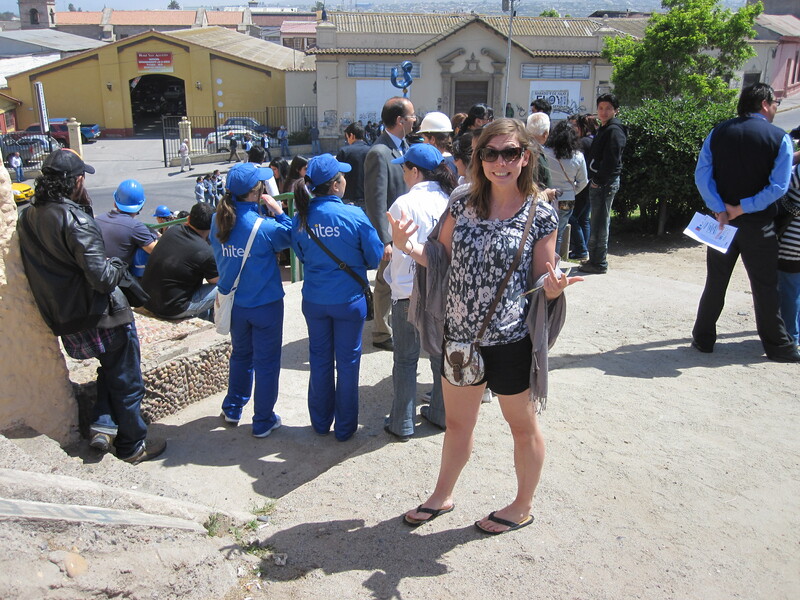 We then stopped off at a small Pisco distillery called ABA which has been making the drink since 1921. Although arguably it was the Peruvians who made the drink first, it is the Argentinians who call it their national drink (there was a Peruvian lady on the tour and her and Hector had a tongue and check spat about this as we drove along in Spanish…quite funny to observe!). Pisco starts its life as a wine but then is distilled into a high alcohol content liquor. The locals drink it neat with ice or make Pisco Sours with egg, lemon and ice (which personally sounds a bit gross!). We tried 4 types of Pisco. 1 that had been aged in an oak barrel and tasted like cognac/brandy. The second was ‘alcohol for pisco’ which was 67.5% and illegal to be sold in Chile…needless to say I coughed after tasting that one! And then a couple mixed with mango etc which were much more drinkable! The highlight of the day for me though was our lunch stop at a solar restaurant at a hill-side village called Villaseca. 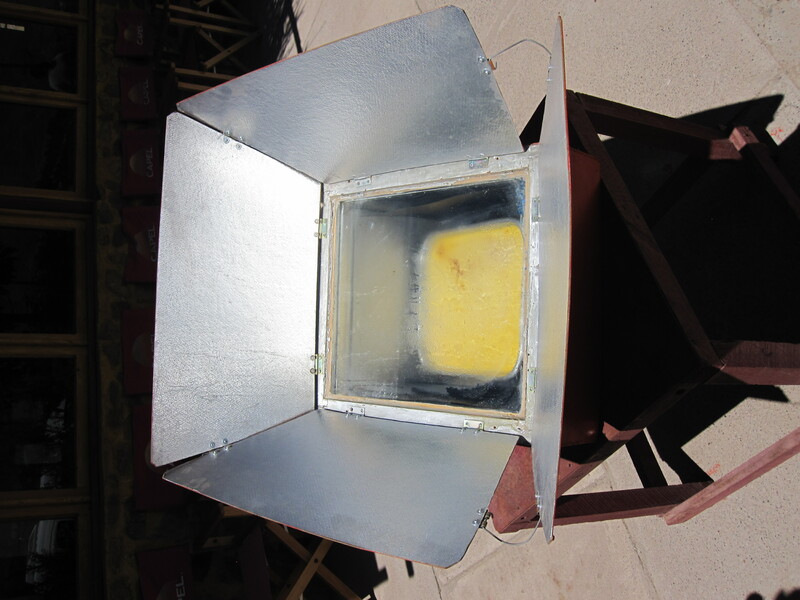 All the food is cooked in solar ovens in the solar kitchen outside. The ovens are orientated towards the sun and the rays are reflected using silver panels onto essentially wooden boxes with glass tops with the food inside which then cooks. I’ve included some pics so you can see what I’m talking about.There was also a hob/grill which used essentially a flattened out concave disco ball underneath it to reflect the sun rays up onto the rack. A kettle on top of that takes 12 minutes to boil so 2 to 3 times longer than conventional cooking but very very cool. Hector rang our orders through earlier in the day so the lunch was ready for when we arrived…we didn’t have to wait 3 hours or anything! I don’t know if it’s just the human geographer in me but the story behind this solar restaurant I found really affirming. So the story goes…the villagers of Villaseca are all quite poor and when they ran out of gas, or couldn’t afford gas in the first place, to cook they used to go up into the mountains and cut down the small trees and shrubs to burn. This accelerated desertification of the slopes, made the slopes more unstable, bad stuff etc etc. 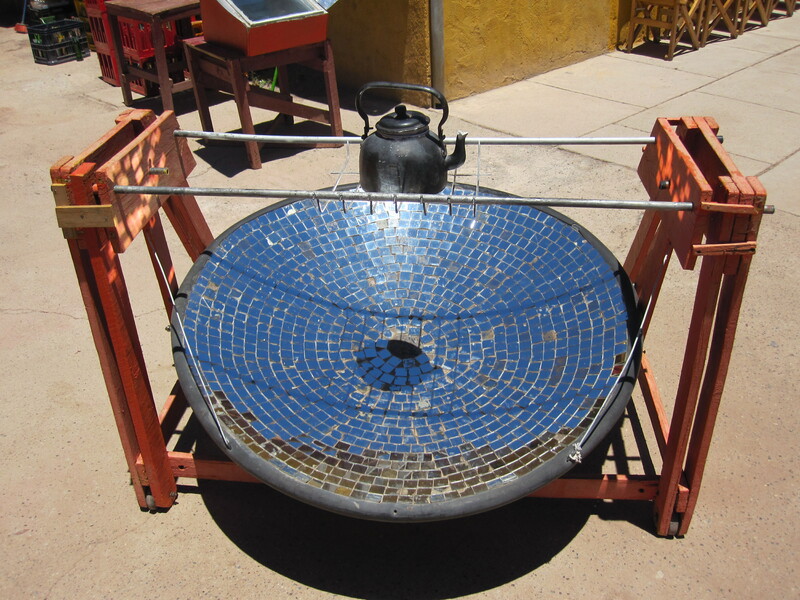 So a group of students from the Chile Uni’s put a bid into the government to introduce solar ovens and solar kitchens into the village so the families could still cook for free without cutting down the trees. So now all the village homes have solar kitchens. Although the mountains still look pretty deserty to me! The restaurant we ate in is ran as a cooperative. All the ladies from the village work there in groups which rotate weekly. They all get paid the same (small) salary but get an equal share of the profits twice a year- once before Christmas in December and the second time in March before the children go back to school. A really simple, clever idea which seems to be working well for the village and the community and the food was really tasty too! Our last day in La Serena was Tuesday and we took a walk around 5 of the whopping 29 churches across the city. Not many of them are used regularly for worship anymore but they are still nice looking buildings. The city was known as the ‘City of Bells’ as every hour on the hour all 29 churches used to ring their bells…must have been so loud! 10 years ago the local municipal government put a stop to this on the back of the many complaints from the locals that it was disrupting their sleep…I can see their point of view! We visited Iglesia Catedral, Iglesia Santo Domingo, Iglesia San Francisco, Iglesia San Agustin and Iglesia la Merced which are all open during the day and you can come and go quite freely. We also checked out the main 2 museums in the town. Museo Arqueologico de La Serena and Museo Historico Gabriel Gonzalez Videla. It cost 600 pesos to get into Arqueologico one but then you got into the Historico one for free which was good. 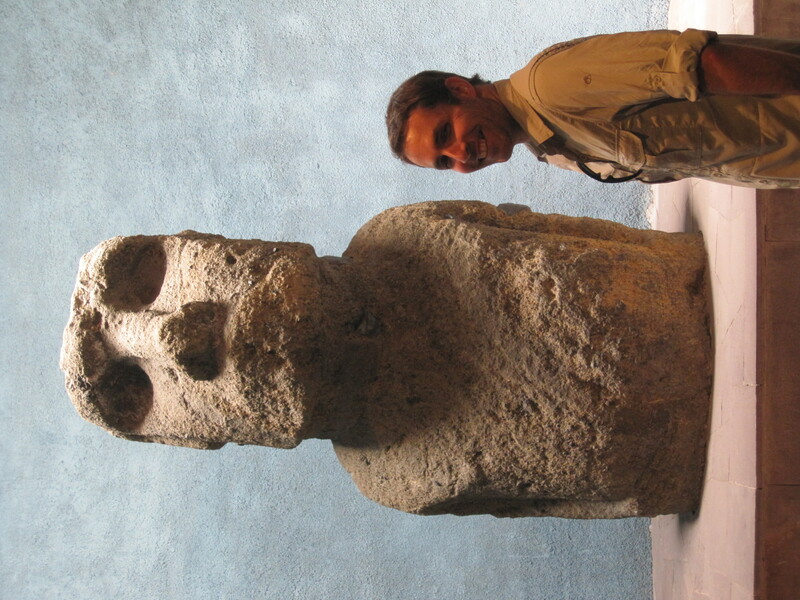 The highlight of the two is the Easter Island exhibit in Museo Arqueologico which had a 3 meter tall Moai- the carved stone faces that Easter Island is famous for. It was really very cool and made me completely want to go and visit Easter Island. We looked into it but it is super expensive so we’re going to take a detour to Vina del Mar on the way back down to Sanitago which has a whole Easter Island Museum so we can learn a bit more about it then. I know I’m a geek! Our visit to the Museo Arqueologico got disrupted half way through by a loud siren like the ones used in the World War’s to raise the alarm of a bombing raid. We got evacuated from the museum and pieced together from the ticket man’s spanish that this was a mock simulation of a tsunamis evacuation and the procedure was to head away from the coast until you are above the road called Balmaceda! In the end we just followed the stream of locals up the street to a little park which must have been a designated congregation point and waited there for 20 minutes. There were loads of people in hard hats and high vis’ jackets and TV crews and helicopters flying overhead and fire service and ambulances driving around. It was really quite exciting! But I don’t think people would have been so jovial in a real life tsunamis evacuation! I later found out that Chile gets a little earthquake weekly as it sits on a massive fault line and the La Serena area gets a big earthquake once every 10 years. The last big one was in 1997 so its 4 years over due…was kind of pleased that we were heading further north that evening! So our longest bus journey yet was our overnight bus from La Serena to Arica. A massive 23 hours! It was comfortable enough, but we were completely unprepared. Bus’s in Argentina give you food but bus’ in Chile do not we discovered. So we rationed our packet of Pringle’s and half a bar of chocolate for dinner, breakfast and lunch! The landscape for the 23 hours was just desert, arid moon like landscape. Quite boring really! Until an hour before Arica when we were essentially driving on the edge of a canyon which was cool if a little scary! We arrived in Arica 4 pm on Wednesday and we’ve spent 2 nights here before heading up to Peru. Arica is a city and not a very pretty one! We’ve probably spent a night longer here than most travellers, and perhaps more than is necessary, as it is essentially a transition point to get the taxi across the border into Peru. But we’ve appreciated the break in the overnight buses and the hostel we have been staying at (Sunny Days Hostel) is run by a kiwi called Ross who is lovely and has lots of places to flop, play cards and recuperate. So off to Peru tomorrow at 10am and I really can’t wait. 7 days until we start the Inca Trek up to Machu Pichu- WOOP! Must try whilst in the area= Pisco! So, forget what I said in an earlier blog about getting by with only a few words of Spanish. Everyone who’s thinking of coming to South America should learn more of the local lingo than we did. Sure, I can buy things, order bus tickets and I can ask questions…but I don’t have a clue what the answer is. Not being able to understand the local lingo can also make border crossings a bit daunting. Luckily the one from Argentina to Chile wasn’t too bad, bus stopped at midnight, get out, passport stamped out of Argentina, into Chile, no questions, no problems. However on the 23 hour bus journey to Arica, the ‘bus guy’ collected our passports for some reason which made me feel very uneasy, as I don’t like it leaving my sight. I tried to ask in my best Spanish…”why take passport”, but of course I had no idea what the answer was and he spoke no English…fortunately after an hour of so we passed a checkpoint and our passports were returned to us!! Now, lets see how the Chile-Peru border crossing goes tomorrow, fingers crossed for someone who can ”ablo ingles”! !